Instructions for use: Empty all ingredients from the bags and put them in the cup, pour in hot but not boiling water, stir well, then serve hot. This product is packed in factory using milk, peanut, sesame seeds and soybean, and may contain traces of other nuts and/or seeds. 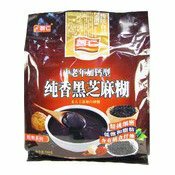 Ingredients: Black Sesame Seeds (75%), Sugar (10%), Black Rice, Brown Rice, Peanut, Maltodextrin, Flavouring. Simply enter your details below and we will send you an e-mail when “Black Sesame Powder Mix (Walnut Flavour) (智仁芝麻糊)” is back in stock!